Womens Empowerment Skill Workshops: Our workshops offer hands-on skill building & exploration of how societal myths have kept women down. Be part of the family and contribute now. We believe that when women discover and rediscover our physical capabilities, we also embrace our independence, our fundamental leadership abilities, and the strength to stand for ourselves and social justice. We need your help to raise $20k to accomplish our 2017 goal of reaching 700 women through 24 skill based, empowerment workshops that are open to all women and focus on low-income and marginalized communities. Together we can smash the myth of frailty. ~If you like perks for your donations, they’re all listed at the bottom of the post! We have an over 300 women strong waitlist for our next workshop series. 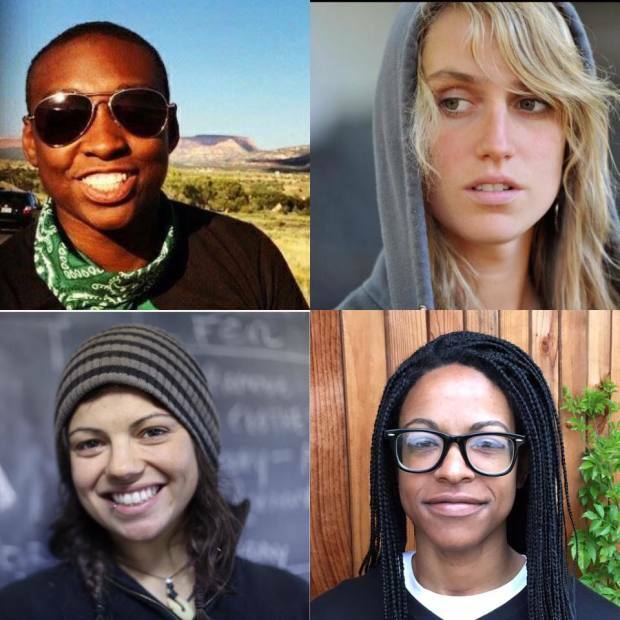 We need your help now to fund these workshops so that we can continue to provide this most necessary service to the community and continue fighting for gender equality! Frailty Myths is a dream that began as a group of friends imagining a space for women that was as powerful and supportive as that friendship. 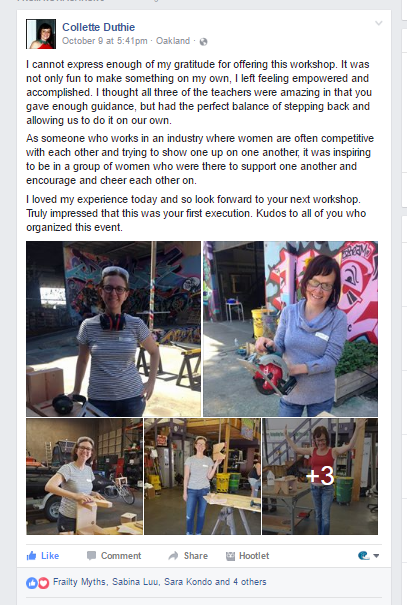 Frailty Myths is a non-profit that offers an array of workshops that train women in traditionally male-dominated activities like welding, construction, climbing, art, and sailing. Each workshop offers hands-on skill building as well as facilitated discussions that examine the learning experience and how societal myths have kept women from actively participating in these spaces. Frailty Myths workshops aim to empower women to recognize and dispel the myths of frailty through dialogue and exploration of our physical capabilities. This October, our dream became a reality when we launched the first Frailty Myths workshop series. Within days, over 300 women registered for our first workshop through our website and over 1500 women expressed interest. 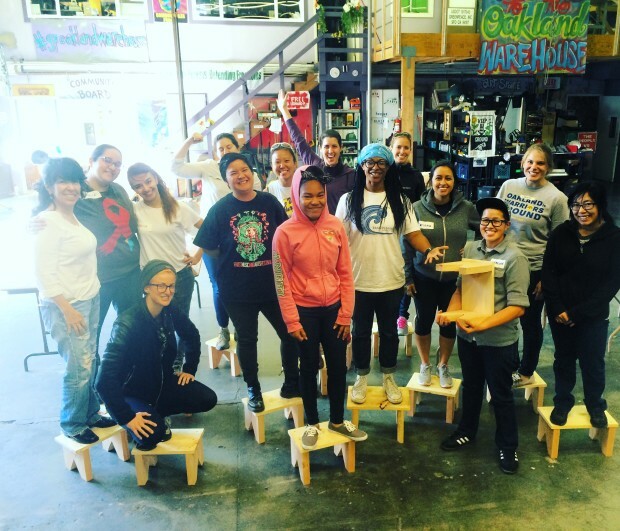 We have hosted 5 successful woodworking workshops that over 75 women attended and left with not only a step stool they’d made themselves, but also feeling empowered and supported. So far we’ve done this entire process on our own. Everything that we have created, from the 501(c)(3), to the website and the workshops, has been self-created and self-funded by our leadership team. We are ready to take the next step and provide these workshops to women across the country– but we need your help. Please donate now. We can’t get there without your help and support and every little bit gets us closer to the world we’re working to build. We believe through our own experiences that when women discover and re-discover their physical capabilities, our bodies and minds become stronger. When we realize we are strong and capable, we also embrace our independence, our leadership capabilities, and our ability to stand up for ourselves and for others. Our project seeks to outreach and hold space for those who do not identify as men. We hope to create a community and network including members of the trans and gender non-conforming communities. Caption: The Frailty Myths Woodworking Workshop: Our workshops have allowed women the space to explore an introduction into power tools and construction materials, take home something that they have constructed during our afternoon together, and have a group conversation about the societal myths surrounding femininity, frailty, strength, and power. This fundraiser will fund the first three months of Frailty Myths by providing seven workshops, one full time Frailty Myths staffer, and over 200 women exploring their strength and smashing the myths of frailty together. Our goal for 2017 is to do even more and reach over 700 women by hosting 24 workshops and community events that are accessible to all women, with a focus on low-income and marginalized communities. 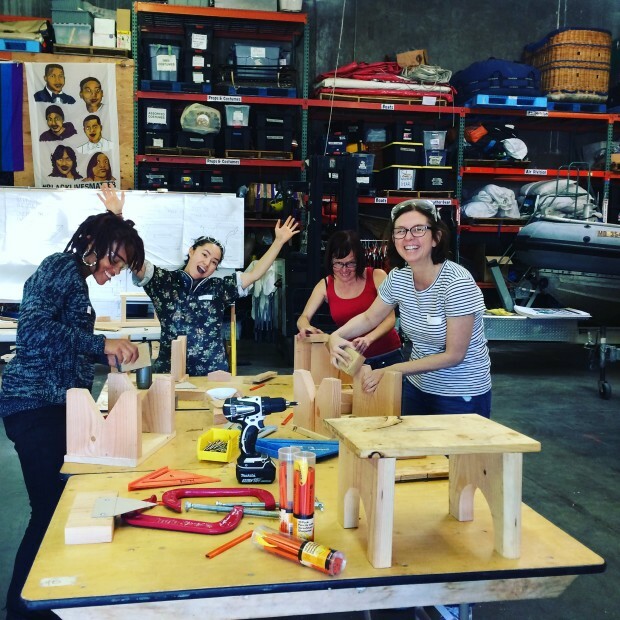 ALL OF OUR COMMUNITY WORKSHOPS ARE DONATION-BASED. NO ONE WILL EVER BE TURNED AWAY FROM A FRAILTY MYTHS WORKSHOP FOR A LACK OF FUNDS. Two (2) workshops per month. Workshops TBA will be located in either Oakland, New York, or Washington D.C.
Three (3) Frailty Myths community events held in either Oakland, New York, or Washington D.C. Your donation goes directly to funding these workshops and allowing women to participate in spaces that they have been traditionally kept out of. Georgia Faye Hirsty works in the environmental justice movement with a focus on the use of non-violent direct action as a tactic for change. Her work is deeply rooted in the understanding that the fight for justice necessarily includes solidarity with every fight for justice, and that exploring the intersections of oppression is a necessary part of dismantling it. She also hold her USCG 100ton Captain’s License. Erinn Carter has worked in progressive politics for more than 15 years. Her work has encompassed everything from the theory of political science through her PhD work at UCLA, which specialized in Race and Ethnicity in the American political context, to her real-life political experience, including work with labor unions, community organizations, and activism across the United States. As a black woman, her primary professional and personal focus has been in the fight for justice for communities of color. Susan Goodwillie is a co-founder of SPACE on Ryder Farm, a nonprofit residency program housed on a working organic farm. She is also a social worker at the Mental Health Project at the Urban Justice Center– a nonprofit that provides free legal and advocacy services to low-income New Yorkers living with mental illness. Pearl Robinson was born in Florida, raised in New Jersey, and tells people that she’s from Brooklyn. She attended CUNY Medgar Evers in Brooklyn, New York and studied Journalism there, which comes in handy because the justice organizations she has worked for actually break the big stories and are true watchdogs of democracy. In her spare time, she enjoys singing karaoke, speaking loudly in inappropriate spaces, riding her bike, and watching funny YouTube videos. Send us an email to info@frailtymyths.org after you make your contribution and let us know what perk you’d like! $3000 USD: Sponsor a full FM Workshop. What’s cooler than going to a Frailty Myths workshop? Donating funds so that TWENTY FIVE women can go to a Frailty Myths workshop! Donate $3000 and fund an entire workshop, from materials to advertising and snacks. Be the change you want to see and gift a group of women with an afternoon of empowerment and patriarchy smashing. $25 USD: Frailty Myths Stickers. Become a part of Frailty Myth’s team with a packet of official Frailty Myths stickers! Put them on things like your cell phone, notebook, and best friends (ask first)! $100 USD: FM T-Shirt + Stickers. Show off your support for Frailty Myths with your donation! Give $100 of support and get a Frailty Myths t-shirt and sticker pack. Each pack contains one (1) Frailty Myth’s shirt of your selected size and a pack of five (5) Frailty Myth’s stickers. Each shirt is pre-shrunk, made of 100% cotton, and printed by a local artist here in the East Bay. Sizes are XS to XL. $150 USD: FM T-Shirt Pack + FM Tote. Get our Frailty Myth’s T-Shirt Pack with one (1) FM t-shirt and five (5) FM stickers AND a Frailty Myth’s Tote Bag. Bag is made of canvas and printed here in the Bay Area by a local artist. Smash the patriarchy and show your support for Frailty Myths around town with our FM swag! $150 USD: FM T-Shirt + Oakland Coffee Co. Some of us can’t smash the patriarchy until we’ve had our first cup of coffee. If that’s you, get our FM T-Shirt pack with one (1) FM t-shirt and one (1) pound of coffee from the Oakland Coffee Co. This coffee is certified Fair Trade and roasted right here in the East Bay. You can even compost the bag! $300 USD: FM T-Shirt Pack + Queer Gym Membership. Wanna #SmashThePatriarchy at the gym? We do too. Get a Frailty Myth’s T-Shirt pack and a one month membership to The Queer Gym, ritght here in Oakland, CA. The Queer Gym is the first and only LGBT gym in the Nation. Their mission is to make happy, healthy homos by providing a safe space to workout with a community that gives a damn about you and your goals. $500 USD: Spot in Upcoming FM Workshop. All of the workshops we have offered so far have sold out very, very quickly. This donation covers the full cost of our overhead for each participant and guarantees you a place in the next Frailty Myths workshop. Get this for yourself or as a gift to a friend. Wanna give but not go? Fund someone in the community. No one in the community will be turned away for lack of funds because of your donation! $1000 USD: Materials for a FM Workshop. 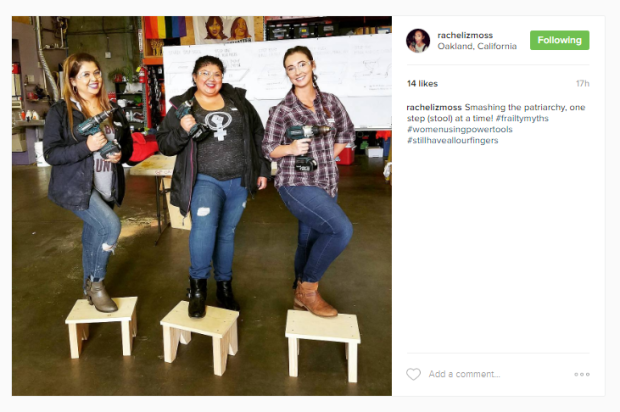 Make sure we’ve got the materials and supplies to smash the patriarchy! 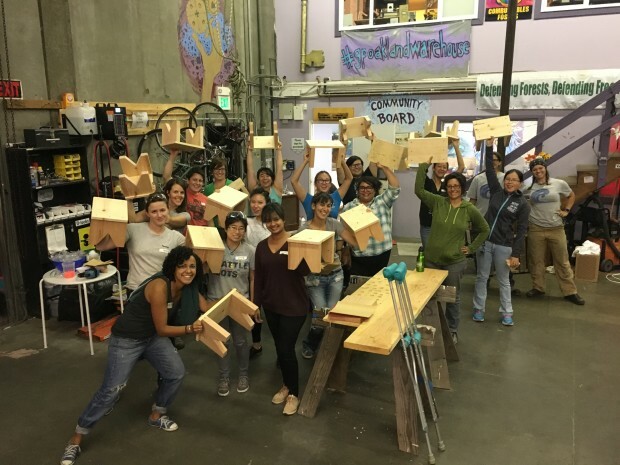 Making a $1000 donation ensures that we’ve got the materials, including raw materials like woods and nails for our wood working series, to snacks and water for all participants.